Tear Aid Type A Fabric Repair Kit. Gold packaging, repairs holes and tears instantly. Tear Aid unique airtight, watertight, elastic composition stretches and springs back absorbing the force that causes ordinary repair product to be torn off. 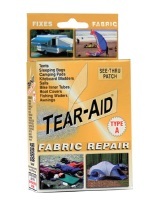 Tear-Aid® Original Type A repairs rips and holes in a wide variety of materials. It is a peel and stick patch made from an exceptionally tough, matte finish, abrasion resistant, polyurethane elastomer that resists puncture and tearing. It is combined with an aggressive adhesive formulated for high strength bond to a wide range of surfaces such as canvas, non-oiled leather, rubber, nylon, polyester, neoprene, most awning or umbrella fabrics, most plastics, paints, aluminum, stainless steel, fiberglass, polyurethane and polyethylene. Tear-Aid® Type A is a great patch for tents, sleeping bags, tarps and most of your outdoor gear except vinyl.